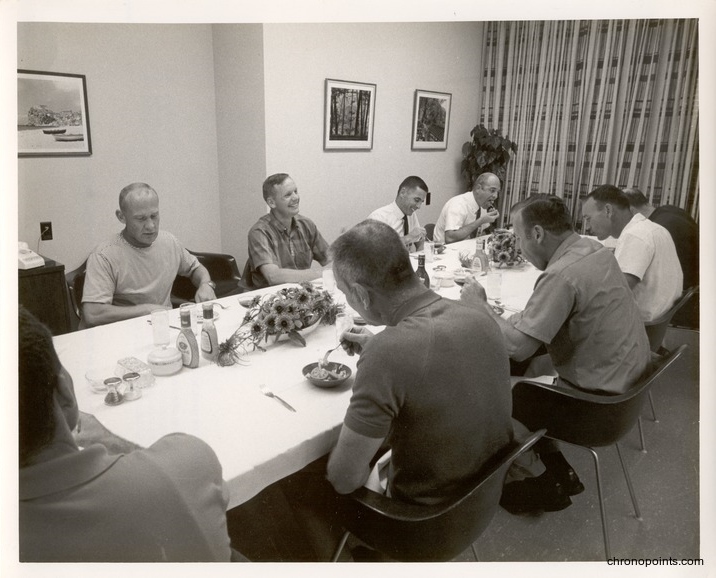 The Apollo 11 crew eating dinner the night before the flight with other astronauts at the Manned Spacecraft Operations Building (MSOB) of John F. Kennedy Space Center (KSC) in Merritt Island, Florida. Photographed in the foreground, from left to right, are astronauts Fred Haise (1933-), Deke Slayton (1924-1993), Jim Lovell (1928-), Command Module Pilot Michael Collins (1930-, and Ken Mattingly (1936-). Across the table, from left to right, are astronauts Lunar Module Pilot Buzz Aldrin (1930-), Mission Commander Neil Armstrong (1930-2012), William Anders (1933-), and Ronald Evans (1933-1990). Original black and white photographic print, July 15, 1969: Leonard Pugh Collection. Digital reproduction of original black and white photographic print, July 15, 1969. 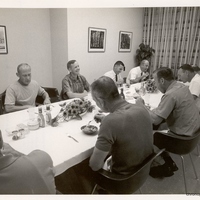 “Apollo 11 Crew at the Pre-Flight Dinner.” RICHES of Central Florida accessed April 20, 2019, https://richesmi.cah.ucf.edu/omeka/items/show/6082.